Hello, my name is Leah Fitzpatrick and I am a student who has been working with Sarah Ayling and Nevil Quinn on the DRY project for four weeks, through Nuffield Research Placements. I have worked at the University of the West of England’s Frenchay Campus, which is right next to the field site that Sarah has been working on for the past three years. I even got the chance to visit the field site and learn about the samples that she has been taking as well as take some measurements myself. 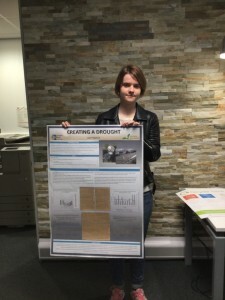 Sarah was looking at the effects of drought on mycorrhizal fungi, which were measured by taking samples under simulated drought plots that had reduced rainfall, and comparing them to samples with a normal amount of rain. My investigation, however, focused on the effectiveness of the drought plots and I examined this by analysing data from rain gauges that were placed across the site, and comparing it to the previous rainfall in the area. I spent a lot of time on excel cleaning the data by searching for missing points and raising these with Sarah, who looked in her notes and found out if the rain gauges had been recording that day. Her notebook was very helpful, as it had comments from every time she visited the field site about the weather and the condition of the equipment. Nevil taught me how to use pivot tables in excel, which were very useful when having to deal with such large sets of data – since the gauges had rain values every minute for the duration of three years. I also learned to use IF statements and combination graphs which allowed me to process and present the data as clearly as possible, so I could see the trends. From my investigation, I found that the drought plots barred 50% of the rain on the site from falling on the plot. I was very happy with this result, as this was the proportion the plots were set out to catch, so this aspect of the project was successful. I’d like to thank Nevil and Sarah for all the support they gave me throughout the placement. I wish them all the best for their future research.